These pouches will hold just about anything. Keep all your bullets in one place, hold your glass, keep your silicone from acting like a Swiffer pad. The high quality of these pouches won't let you down. I get really frustrated when trying to find someplace to keep my silicone toys that like to gather lint. I mean, even taking them out of the box they pick up tons of stuff sometimes, and not to mention, keeping them all in their original boxes can get quite space consuming after a while. So I started looking into toy pouches, and found these. I'm in love. I can get it in purple or black, the pouches are padded but not so much that they might as well not have a closure, and it saves me so much space. The outside is a really soft microfiber, almost suede. It has a drawstring closure that cinches well enough that even a handful of bullets being stored in there wouldn't be able to work themselves out. While each pouch is about 10 1/2" long, once closed, you'll really only get about 9" out of it. Across the bottom is about 4 1/2" across, and across the top when closed and laid flat is about 2". So if you have a big blocky thing, in there, it might not close, but most things are going to fit. I've got my White Heat Rabbit inside of one of them, and getting a rabbit in can be a bit tricky. While the lovely polyester inside is going to prevent my toys from picking up lots of lint, any silicone or anything that has any grab to it is also going to grab the polyester. For things like that you have to basically pull the polyester part out and get the toy nestled in past the parts that stick out, then it'll drop right in. The pouches seem really well made, although I might not chance running them through the washing machine. There really isn't much that might get these dirty, but hand washing and air drying should suffice for cleaning. 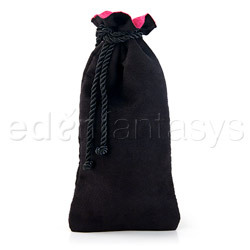 Just make sure that your toys are clean and dry before they make their journey into this awesome pouch. As I said earlier, the padding isn't very thick, and it actually seems to be more the thickness of the materials than any actual padding. However, I wouldn't place money on it keeping a glass toy from breaking if dropped while inside one of these pouches, but for rolling around a drawer it'll definitely keep them from chipping. There's really no downside to these pouches, other than they won't hold a toy longer than 9" and wider than about 4". If you've been looking for a great way to protect your glass or keep your silicone from being a Swiffer pad, invest in some of these awesome pouches. I love these pouches, anything I can fit into one, I stick in it. It's still not going to protect your glass from a huge fall, but unless you're trying to break your glass toy, you shouldn't have a problem. The only thing I don't like about it is that it seems to leave impressions of its material on toys with certain textures. So far I've only run into that problem with my White Heat Rabbit, but if I had to guess, anything with that same smooth shiny surface. Thanks for the review! I should definitely pick up a few of these. Thank you for clarifying about the thickness of the pouch, that's exactly what I was curious about! ScarlettSeraph, I'm glad I could help! Just For Fun...How Many Do You Have? Thank you for viewing Toy pouch – storage container review page!